The FTD Florist Scorecard allows Member Florists to review and optimize their business practices when filling FTD.com orders. The Florist Scorecard was designed to provide insight into a Member Florist’s fulfillment performance and allow them to monitor their quality, refusal and customer satisfaction ratings. This tool is updated monthly and contains valuable data to guide business decisions and maximize order potential. Members will also learn how they compare to other florists in their markets. The ultimate goal of the Florist Scorecard is to help FTD Member Florists identify opportunities to improve their Quality metrics, receive more orders and instill industry best practices. 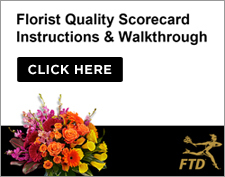 To learn more about the FTD Florist Scorecard and view instructions and a walkthrough of the site, CLICK HERE. Questions? Please reach out to the FTD Quality Team at qsr@ftdi.com.